The Pointwise User Group Meeting 2013 held in Fort Worth, Texas, on 19-20 March was headlined by a diverse set of user presentations on topics ranging from heat transfer inside nuclear reactor rod bundles to an attempt to set the world land speed record. In addition, Pointwise staff provided training on new capabilities introduced in the most recent version of Pointwise and gave a preview of features being worked on for the next release. In conjunction with the meeting, the Meshy Award for most outstanding mesh generated with Pointwise or Gridgen was awarded to a team of engineers from CRAFT Tech in Pipersville, PA. Their hybrid mesh for a low head safety injection pump used in nuclear power plants had to be completed in an extremely short time, so they divided up the meshing among four people to get it done as quickly as possible. The team of Dr. Vineet Ahuja, James Chenoweth, Don Kenzakowski, and Zisen Liu divided the pump into different geometric components and each team member meshed a different part. They then stitched together their component grids to make the final mesh which consisted of 21.5 million cells and 950 blocks. 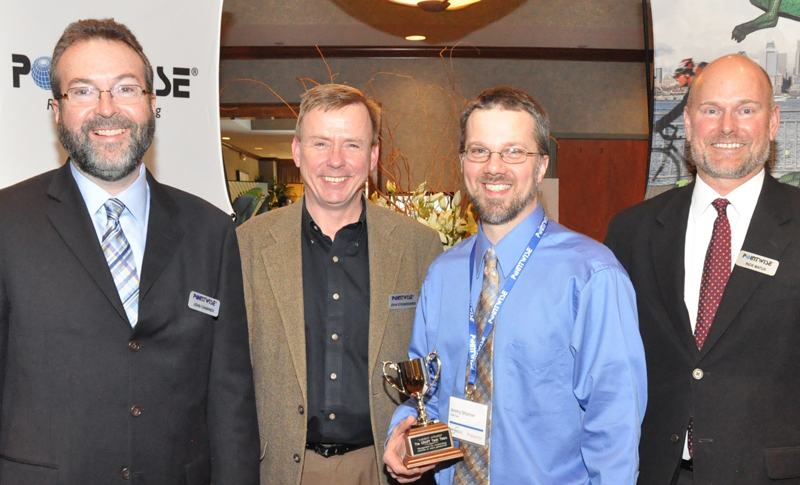 Figure 1: Jeremy Shipman, third from left, accepted the 2013 Meshy Award trophy on behalf of the CRAFT Tech team, from (left to right) John Chawner, president; Dr. John Steinbrenner, vice president of research and development, and Dr. Rick Matus, vice president of sales and marketing, all of Pointwise. For efficiency, they varied the cell types in different blocks. Hexahedral cells, which provide maximum accuracy, were used for the impeller, hybrid T-Rex cells were used in the inlet, diffuser, collector and discharge flowpaths, and isotropic tetrahedral cells were used to stitch regions together. 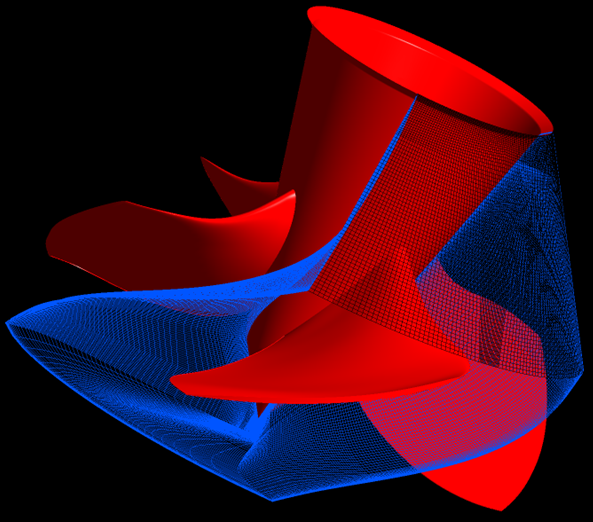 Unsteady flow solutions were computed on the as-built and modified geometries with CRAFT Tech's CRUNCH CFD solver. Using their divide-and-conquer strategy, the team was able to meet the project's stringent deadlines and provide good results to their customer. Figure 2: The CRAFT Tech Team's Meshy Award winning grid for a low head safety injection pump. The first day of the user group meeting consisted of training seminars. In addition to new features in Pointwise, there were training sessions on expert tips for structured meshing, using the elliptic smoother to improve mesh quality, writing a CAE plugin, and diagnosing and correcting typical problems encountered during the grid generation process. Pointwise is a general purpose mesher. As such, it is has many capabilities and is constantly being improved by adding new features and making modifications to existing features. By attending training, users quickly learned how they can use the new features in Pointwise to make better meshes in a shorter time. New features covered included the advancing front surface mesher, the ability to remove and add topology to domains and blocks, new keyboard accelerators, setting CAE solver attributes, exporting face-based data through the CAE Plugin API, and new CAE exporters. Two of the training seminars covered structured grids: Tips and Expert Tricks for Structured Meshing and Smoothing Structured Meshes. Erick Gantt, Pointwise engineering specialist, gave tips on laying out a structured grid topology, using manual block assembly when the automatic assembly does not produce what you want, and using the elliptic smoother to reduce cell skewness. Figure 3: Erick Gantt demonstrated how to smooth structured meshes. The CAE plugin seminar hosted by David Garlisch was geared toward people who want to develop an interface to export grid and boundary conditions from Pointwise to their own CAE software. Pointwise's CAE plugins provide an easy way to do just that, and the seminar described how to download the plugin SDK and get started with development of a new plugin. The final training seminar, Meshing Forensics, presented by Travis Carrigan, covered situations that are often encountered during the mesh generation process that can cause difficulties and how to handle them: trimming CAD surfaces, finding gaps and overlaps in a CAD model, creating missing CAD, making sure grids are actually on the proper CAD surfaces, and improving quality of volume meshes. One attendee said this was his favorite training session, adding, “Meshing Forensics was fantastic with quick but essential tips.” The Meshing Forensics topic was chosen by customers via an on-line poll prior to the meeting. Metacomp Technologies was unable to exhibit due to a schedule conflict but sponsored the meeting. The second day of the meeting was a full day of technical presentations by Pointwise staff and users. 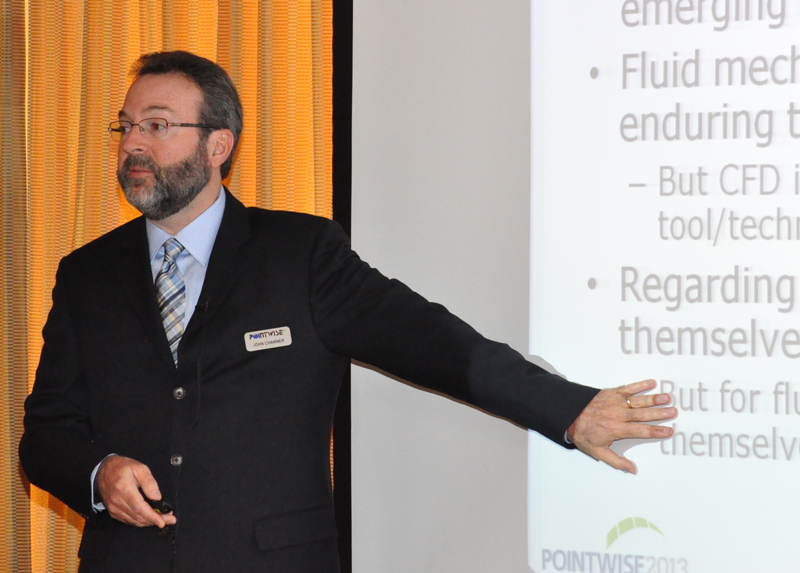 John Chawner, president of Pointwise, started the day with an overview of the current status of Pointwise and Gridgen. He also provided some perspectives on where the CAE industry in general and the computational fluid dynamics (CFD) segment, in particular, seem to be heading and how Pointwise fits into that. Figure 4: John Chawner discussed CFD industry trends and issues. Dr. Michael Böttcher from Kahrlsruher Institut fuer Technologie, the Meshy Award winner from the last user group meeting, presented his work on analyzing heat transfer around nuclear fuel rod bundles immersed in a liquid lead-bismuth coolant. From a meshing standpoint, the most difficult part of the problem is handling the tangent intersections between the fuel rods and their attachment points. His CFD solutions showed good agreement with analytic and experimental results for pressure drop and heat transfer. Figure 5: Michael Boettcher's grid for coolant flow around rod bundles. Jeremy Shipman from CRAFT Tech, representing this year's Meshy Award winners, showed the team approach they used to meeting a tight deadline for a project. 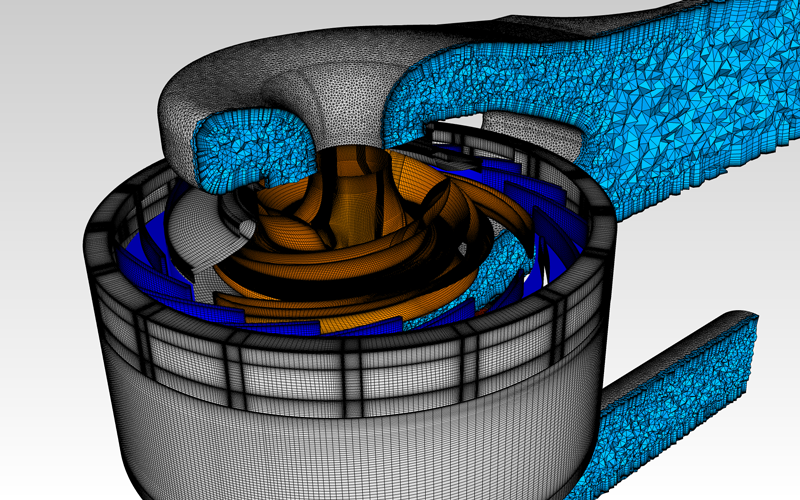 Given a very short turnaround time for a challenging analysis of a low pressure safety injection pump for a nuclear power plant, they divided the meshing problem into several parts so that each could be worked on in parallel by different people. This enabled them to quickly complete a complicated, high-fidelity mesh in a few days and meet their project deadline. The next paper, by Dr. Umesh Paliath from GE Corporation, discussed large eddy simulation for engine noise prediction. 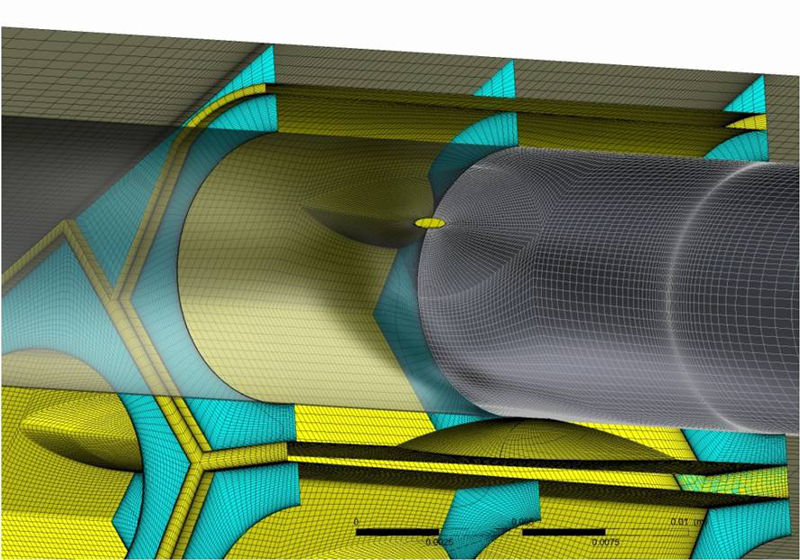 Large eddy simulation requires high-quality, structured grids, which can be difficult to construct on advanced nozzle geometries with chevrons and lobes that are being used to reduce exhaust noise. They are able to get good predictions of jet exhaust noise levels and are looking at ways of automating their analysis process. 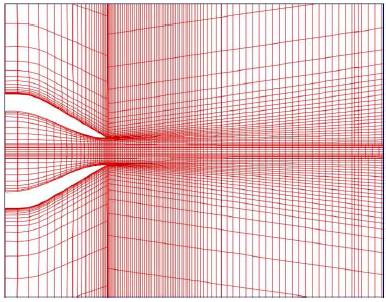 Figure 6: A slice through Umesh Paliath's grid for jet engine noise computations. Mrs. Barbara Schoenborn from Voith Hydro described the process of analyzing Kaplan turbine performance using multiple-block structured grids. Voith has found that adding more geometric detail to its analyses has increased the accuracy of its performance predictions, but makes mesh generation more difficult. Voith also is investigating the use of Pointwise Glyph scripting to automate its mesh generation process. Figure 7: A view of Barbara Schoenborn's grid for a Kaplan turbine. Dr. John Steinbrenner, vice president of research and development at Pointwise, gave attendees a preview of a structured mesh adaption technique that will be released in a future version of Pointwise. It is part of the overset grid assembly suite of features being worked on for that release. The mesh adaption will be used to help correct any cell size mismatch problems between overlapping grids discovered during the overset grid assembly process. Dr. Steinbrenner showed several examples of adapted grids and amazed the crowd with feats of tensor calculus and matrix algebra. Switching to a more applied topic, Kevin Colburn from CEI showed how CFD is being used to help improve the performance of a modified F-104 aircraft being used for a land speed record attempt by the North American Eagle project. The existing design was digitized and analyzed to determine the sources of drag, lift, and moments. This information was then used to make design changes that could potentially result in the vehicle reaching speeds over 800 mph. Eduardo Perez of Texas A&M University discussed how his group is analyzing boundary layer stability for both hypersonic and low-speed flows. For hypersonic flows, they are typically looking at relatively simple shapes that require very high resolution of the boundary layer and high-quality grids so numerical artifacts do not affect their stability analysis results. The low-speed configuration he discussed was an array of discrete roughness elements on the surface of a wing. In this case, the geometry was more complex, but they are able to take advantage of periodicity in the problem to only grid one roughness element to model the entire array. The afternoon break was filled with the CFD Gallery, a chance for attendees to talk to exhibitor partners and Pointwise staff. In addition, Pointwise demonstrated a prototype of a y+ calculator app for the iPhone. When released, this app will let users type in flow conditions and a desired y+ at the first grid point away from the wall, and the app will return how far from the wall the grid point needs to be. 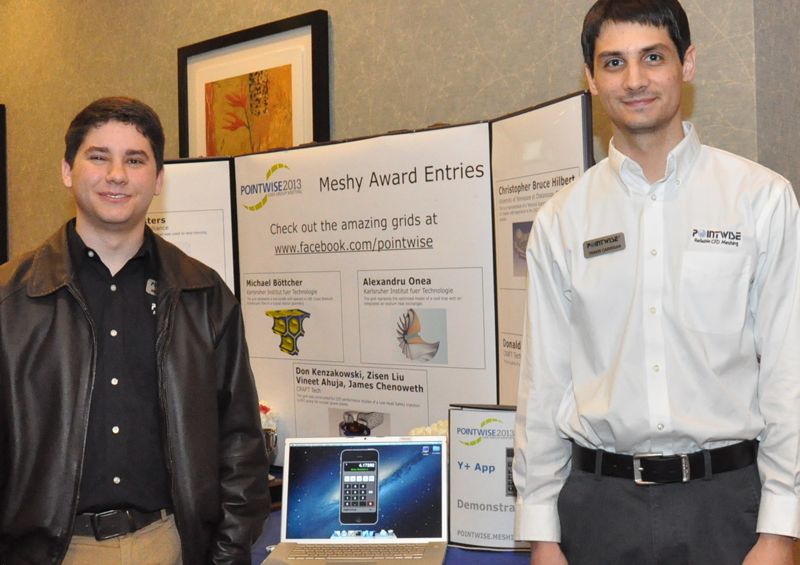 Figure 8: Pointwise staff members Michael Mirsky, left, and Travis Carrigan demonstrated a prototype of their y+ calculator iPhone app. In another preview of a feature coming in Pointwise V17.2, Dr. Ralph Noack from Celeritas Simulation Technology showed how the overset grid assembly tools coming in that release will interface with Suggar++, a general purpose overset grid assembly code. Overset grids are useful for complex geometries and problems with relative motion between components. Each component is gridded individually and the component grids do not have to match point-to-point. Suggarr++ analyzes overset grid collections and determines how they overlap and how to interpolate solutions from one grid to the other, a critical step in the overset grid analysis process. 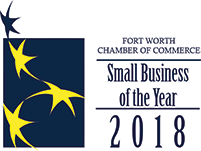 Dr. Mark Landon from Optimal Solutions showed how his company's mesh morphing software, Sculptor, can read geometry and grids from Pointwise and morph them as part of an optimization process. The resulting grid can be read back into Pointwise to be further refined, if needed. Showing how Pointwise is able to fit into a proprietary analysis process and not just handle everything itself, Bruce Hilbert from University of Tennessee in Chattanooga presented results from the university's developed mesh generation software. Using a Pointwise surface mesh as input, they generate voxel-style meshes that include a boundary layer refinement region and can adapt to flowfield features. Bookending the day, Mr. Chawner returned to provide some more industry perspectives and to give attendees a preview of new features being developed for Pointwise V17.2. Along with many productivity enhancers, the major new features being developed are overset grid assembly analysis tools and a general cell data structure that will allow Pointwise more flexibility in the types of cells it can handle and the cell topologies it can generate. The Pointwise User Group Meeting 2013 was a great success and attendees universally commented they learned a lot from the training seminars, presentations, and networking sessions. If you are interested in attending a future Pointwise user group meeting, please watch our UGM home page for details.